The Sandstrom SDABXCR13 is an inexpensive FM/DAB radio with an alarm clock with a stylish and compact design. You probably haven’t heard of Sandstrom before. Sandstrom is a label owned by Currys PC World that consists of affordable alternatives to products from better-known brands. Unsurprisingly, the Sandstrom SDABXCR13 doesn’t have great sound quality, but it’s ok for listening to briefly in the morning and before you go to sleep. This radio has some decent alarm features. You can set the alarm to wake up to either a radio station or a regular alarm buzzer sound. You can also set two separate alarms so you could have one alarm for weekdays and another for weekends. However, there are some issues with using the Sandstrom SDABXCR13 as a clock radio. The display has two brightness levels, but the lower brightness level is still quite bright, so it’s not ideal as a bedside radio unless you cover it or turn it away from the bed. Also, you need to turn the radio on to be able to set the alarm, which isn’t ideal. Other features available include a headphone jack for private listening and a sleep timer so you can drift off without worrying about leaving the radio on. The Sandstrom SDABXCR13 looks very smart and offers good value for money, but it’s not ideal as a clock radio. 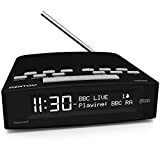 One of the biggest flaws with this radio is that the LCD display is very bright, so it will probably keep you awake if you have it on your bedside table at night. There are better designed clock radios out there for a similar price, so overall the Sandstrom SDABXCR13 isn’t recommended. 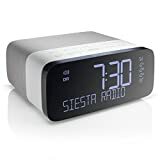 If you don’t mind spending more money to invest in something higher quality, you should consider the Pure Siesta Rise, which is an FM/DAB clock radio that offers great performance and an intuitive design. A good budget alternative could be the AZATOM Horizon, which is an affordable digital bedside radio with Bluetooth. 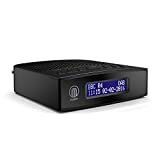 For some more clock radios to consider see this article: Best Clock Radios.